Many of our readers are considering or have considered replacing windows or in some instances even installing new window types into an existing home! There are a ton of windows that serve a unique purpose, and all come with their own set of pros and cons. For the best shot at finding the best window replacement company we recommend talking to your local window contractor. Single hung windows are perhaps the most common window in the United States and Canada. The bottom parts of the single hung window are able to move up and down however the top part of the window restricts this action. This restricted action allows for a greater seal between the top of the window and the frame. This better seal allows for slightly better energy efficiency compared to a double hung window. The double hung windows are a better option if you are willing to forego the factory seal and allow for an easier to clean and more versatile window. See the below diagram to visually highlight the differences. Casement windows always come with some type of hinge to allow for the windows to swing open. The degree to which each of the windows swing depends on what you install and what is possible in your home. Many homeowners restrict the window to only open up 90 degrees, while others allow for a near 180 degree hinge. Casement windows are excellent insulators because of the fewer moving parts as well as the factor welded parts being immovable. or another enclosed area in the event of an emergency. While many homeowners consider glass block windows in their basement due to the tight seal, they can prove to be dangerous in the event of a fire. 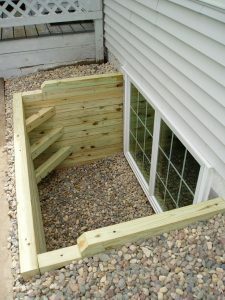 In addition to being a safety consideration, these windows allow for light to easily enter the basement. Awning are very similar to garden windows or small kitchen windows. They are hinged at the top and always swing open or upward. They are popular because with a simple screen, they can be open in the rain or in the sun. Awnings are another iconic window option. A picture window is exactly what it sounds like, a window which displays a picturesque view of your yard. These windows generally don’t open, but always provide you with the most natural light and most stunning view. We nearly left this window type off of our list because many window contracting companies will not perform this type of installation. Glass block windows require mason work for their installation and replacement, and many window companies do not keep one on their staff. For other home improvement needs such as vinyl siding visit us here.